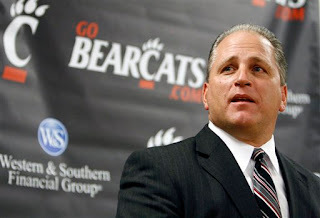 Bearcats Blog: Oh Say Did UC? The day of the Pittsburgh-Cincinnati de facto Big East championship game, some Big East bloggers came up with names for fake UC blogs. One of them, was Oh Say Can UC. In this post where I link stories from around the world about UC, I'm going to take that name and tweak it. Will I come up with a better name soon? Maybe. Today was a slow news day, so every sports site came out with their All American teams. Mardy Gilyard landed on a bunch of these lists. The AP had him second team. The Sporting News had Mardy on the 2nd team and linebacker Andre Revels on the 3rd team. Rivals had Mardy 2nd team WR and kick returner. Jeff Linkenbach was 3rd team at offensive line. SI had Mardy 1st team as All Purpose. Jeff Quinn had a Sugar Bowl press conference today. Some highlights (from Lance McAlister's twitter) Picture courtesy of the AP. In that same vain, Brian Bennett at ESPN conducted an interview with Quinn. Here is part 1. And part 2. Cory Giger wrote an article about the Big 10 expanding. His suggestion: Cincinnati. Nippert Stadium is really small by Big 10 standards. They would probably have to build a new stadium, or play at PBS or something. I'm not really sure how that would work. Rounding around to basketball, the Bearcats ranked 25 in the AP poll and fell out of the ESPN/USA Today top 25, but were the top team receiving votes. The great, great, great Rush the Court blog was at the Crosstown Shootout Sunday. Along with their excellent game coverage, there was this fantastic article by John Stevens about his experience. I recommend this highly. Also, the very, very good Pat Forde wrote about the game on ESPN.com, calling it one of America's great rivalries. There was a very handsome man who wrote about the Shootout as well. That's all for today. Look for the UAB breakdown tomorrow, and then a write up on Wednesday night/Thursday. Thanks for reading.